‘Twas the day before the day before New Year’s day…. Blogs are not what they used to be. Still there’s a few things to share. The Teen Reads area had a pretty quiet fall (with great circulation of reading materials and new titles coming in in person and online), Mockingjay 2 came out AND Star Wars (yet to see either) and the New Year dawns soon. In honor of all those great Young Adult books that get made into movies – some good, some bad, some awful, some amazing – SPL is hosting a movie night and two book2movie rumbles (A book2movie rumble is a loose gathering of interested parties; interested because they like the book, they like movies, they like to write, they like to go to movies, they have a better idea when it comes to taking this book from page to screen…). 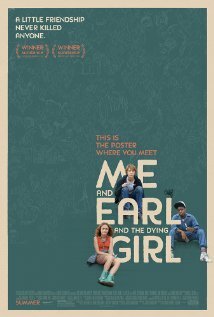 Thursday, January 28th, 6:30 pm we’ll be screening the movie based on ‘Me, Earl and the Dying Girl‘. Copies of the book will be available in the Teen Reads area. The movie is rated PG-13. You are waaaay to young to know about ‘Love Story’, but you read and saw John Green’s ‘The Fault in Our Stars’ perhaps. The book is akin to that scenario but, in my opinion, less flashy, more humor and more realistic. The movie is all that and more. If you are a film buff I think you’ll like this one. Guys would even like this one. Two more Book2Movie Rumbles will be held in February and April this time with books that have been optioned for filming. Hopefully, I will snag someone to talk about writing for the screen or you will learn about creating min-movies on your smart phone or we’ll just talk about all the great things that happen in books that don’t make it to the screen. These two titles have not been chosen yet. Do my work for me and suggest a book that has been optioned and it will be considered for the Rumble. Oh, by the way, The 5th Wave, Rick Yancy’s amazing dystopian novel, will be released as a movie in January of 2016. Says it all. Merry Christmas and Happy New Year. I will SO try to do better next year in keeping up with relevant and reading posts from the Land of the Library.